Storing your reviews in OwnerRez is very important. Learn why by reading our Reviews Overview article. Then learn how to store and search/export your reviews in OwnerRez. One of the most important reasons you want to collect and store your reviews in OwnerRez is so that you can display them on your own personal website. There are two ways of displaying your reviews: using our widgets or Hosted Website features. Reviews are displayed similar to how retail websites, such as Amazon or Walmart.com, display their reviews. This is a design that is known to internet users and provides an intuitive understanding in what they are reading. The top line shows stars and title with the review body underneath. Above the reviews is a simple filter bar that allows the visitor to quickly target certain types of reviews - all critical, one property at a time, etc. There is also a keyword search where the visitor can target specific words like "hot tub" or "canoes" to see what other guests have said about those items. The display is also mobile friendly. On tablet or phone screens, the layout changes to fit the available space in a friendly readable way. No matter what type of website you have, you can quickly drop our Reviews widget in place and start showing your reviews immediately. It only takes a minute and few clicks of the mouse. Read our support article on setting up widgets and it will explain how our widget engine works. That support article also covers common problems and embedding in different types of websites. At the moment, there are a couple of options on the Reviews widget. You can set the text color, define the widget as a "single property" widget and hide the widget if no reviews are available. Like all of our widgets, you can also select All Properties or select specific properties to include, and you can inject custom CSS. We plan to add options for more things like hiding the filter bar, hiding the page bar, page size, animations and so on. Check back soon for those coming features. If you have one of our Hosted Websites in place, it's even easier to show reviews - just turn on that page! Go to your Hosted Website, create a page and select the "Reviews" type of page. 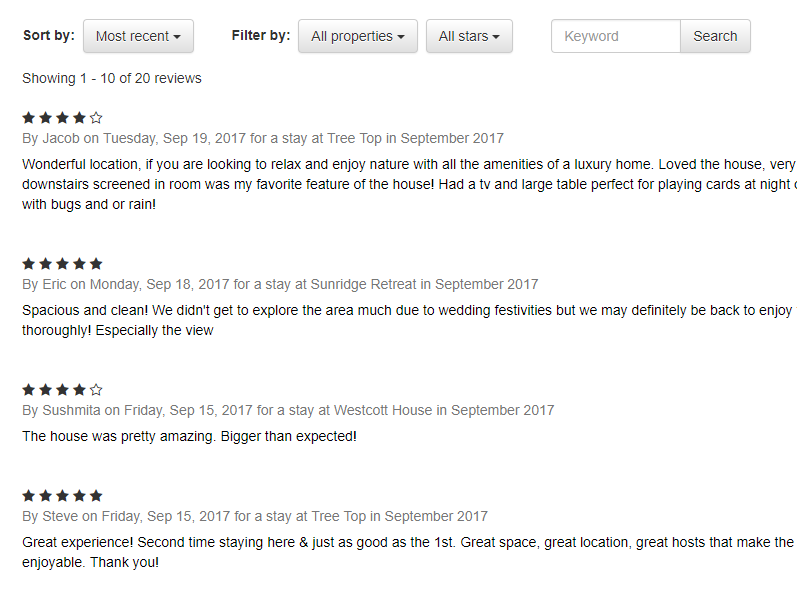 Like other pages, you can select the tab name and intro text, but the reviews will automatically show just as if you had dropped a widget in place.